It’s a real world we live in, and it can be hard to see the reality of life in the developing countries around the world. We are thankful for our volunteers like Yuri who jump right into the thick of the hardships & needs and offer to volunteer their time, and donate their energy! 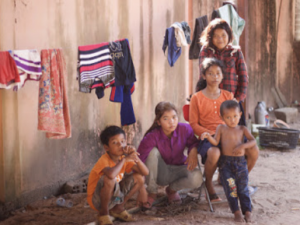 Four months have passed and I can still remember looking out into the distance and seeing a crowd of patients squatting on the ground as they waited patiently under the scorching Cambodian sun to see a doctor. More than anything, I can hear the babies’ wails, smell the scent of human sweat mingling with the ceaseless dust, and feel the weight of babies too small for their ages laying placid in my arms. 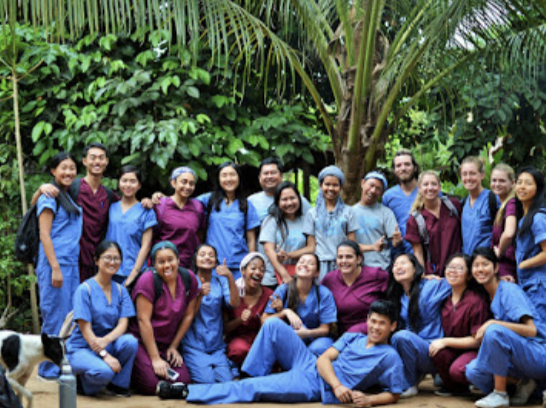 For two weeks this past January, I joined a team called Volunteers Around the World (VAW) on a medical outreach to Siem Reap, Cambodia. Our team of twenty-one university students from three different universities (UNSW, USyd and SBU) set up mobile clinics in villages wherever and whenever we could. Abandoned car repair shops, backyards of village elders, school playgrounds and old temples became the centers from which we offered our services. Together we were able to help 774 patients by giving them treatment, medications and diagnosis that they would otherwise have to go to great lengths to obtain. I went into this outreach expecting to make a difference in people’s lives, not fully expecting the impact it would have on my own. Here are some stories of the people I met along the way. I remember this first girl quite well because she came in complaining of acne. As I prepared to write the topical medication for acne, the doctor I was shadowing started speaking to her in rapid Khmer. She responded with single-syllabled answers, her eyes downcast, clearly hiding something. I sat in silence and observed her becoming intensely more vocal and distraught, until the doctor held up a hand to stop her. The doctor looked over at me and asked if I still thought she came in for acne today. I replied, “No.” He quickly scribbled on the prescription pad, but instead of handing her back the form, he passed it over to me. It was for Gynomax 1-0-1/3d. It was not acne for which she sought treatment, but for a sexually transmitted disease. He asked me to purchase the medication and to be discreet. She was pregnant from the ‘boyfriend’ she was arranged to be marry in a few weeks’ time. A sixteen-year old girl was about to be a mom and a wife. I watched her walk away with an official prescription for acne and the Gynomax tucked safely inside her pocket. Another day I was on the intake station where I had to interview people with the help of a Khmer translator. One patient stuck to me particularly, because she had come to the clinic on the back of a motorbike. She was also 92 years old. She sat down slowly on the intake bench and I proceeded to take a history from her. When I asked her how many children she had given birth to; she replied, “thirteen.” I nodded and asked her, “How many of your children are still alive?” She swallowed and said, “One.” Under cause of death, I shakily wrote down ‘Pol Pot regime.” I could not even begin to fathom how much grief and pain this woman had experienced to have 12 out of 13 of her children killed in front of her and to have only her youngest live since the child was growing undetected in her womb. But there she was, sitting in front of me, talking about the children she fiercely loved and could have raised – as if her loss was just another simple fact of life. On my last day at the pharmacy station, I read the script for a patient who needed Panol and cough medicine. While packing the medications up, I saw that he had presented with a cough, fever, night sweats and weight loss – symptoms that pointed towards tuberculosis. As I finally handed over the bag of prescriptions, I glanced over at the patient. He was a young boy of barely three years ago curled in his mother’s lap. Scribbled on his past medical history – tuberculosis. 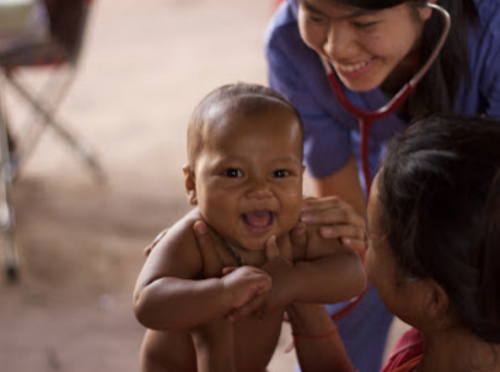 And then it dawned on me – this child had already been through a full round of anti-TB drugs. The boy had already been subjected to the nausea, vomiting, night chills and unrelenting coughs of TB, and all within the first years of life. Yet, here he was, back with the same symptoms. I felt absolutely helpless. Anti-TB medication could only be bought at state-run pharmacies in the city, which were at least a two-hour truck ride away. The best thing I could do – as I watched the mother walk home – was to pray for his fever to subside. There were nights after a long day out in the villages when I couldn’t sleep thinking about what would happen to all these patients. VAW does an excellent job of including the local community and medical staff to make sure patients receive medical care after we leave, but the fact that so many people needed more help than we could provide was beyond unsettling. I began to realize that medicine was not as clear- cut as I had imagined it to be. But the infuriation at the unfairness of it all was surprisingly invigorating. There was so much more that can be done, that should be done and as doctors, we have a chance to be in the thick of things, working towards making a real difference. 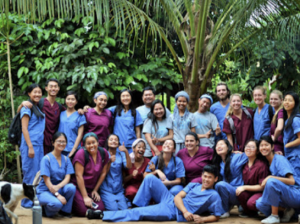 Out there, receiving proper medical care could literally mean the difference between life and death – a fact that reinforces my passion for medicine and desire to pursue a life around it.